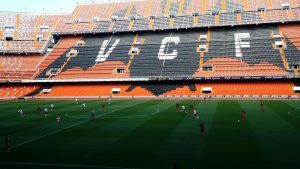 Valencia make their return to the UEFA Champions League on Wednesday evening as they do battle with Italian giants Juventus at the Mestalla. The Spanish outfit have not appeared in Europe’s elite competition since their group stage exit in 2015 but will head into this year’s edition with confidence following their fourth-placed finish in La Liga last season. However, Marcelino’s men have had an inconsistent start to the season this time around and are yet to taste victory in the league after four games. Conversely, Juventus have enjoyed a flawless start to the current campaign having claimed four consecutive wins. As a result, Max Allegri’s men sit proudly at the top of Serie A. As usual, the Italian champions are predicted to do extremely well in the Champions League. They can be backed at 8/1 to win the competition with Betfred. Meanwhile, Valencia are huge underdogs with odds off 100/1 available with BetVictor for them to win the competition at the end of the season. One aspect that will give Juventus confidence is Valencia’s recent record in the Champions League. The Spanish outfit have lost five out of their last seven games in the competition, failing to score in their last three clashes against the likes of Gent, Zenit and Lyon. Juventus then could be a good bet to keep a clean sheet at the Mestalla and can be backed to do just that at 11/8 with Betfred. However, it could be a tough task for Juventus on Spanish soil. Valencia have ever lost twice at home to Italian clubs in the Champions League in their entire history being a 5-1 reverse at the hands of Inter Milan back in 2004. Despite that, they are slight underdogs and can be backed at 19/5. Juventus have odds of 5/6 to claim victory, whilst a draw sits at 5/2. One man that the hosts will surely have to be wary of is Cristiano Ronaldo. The Portuguese superstar signed from Real Madrid in the summer and opened his Serie A account at the weekend with two strikes against Sassuolo. The 33-year-old has had a hand in 19 goals in his last 18 games against Valencia, including 15 goals and four assists. He can be backed to open the scoring at 18/5 with BetVictor. Elsewhere, Rodrigo Moreno is the most likely to open the scoring for the hosts according to the bookmakers. The Spanish forward can be backed at 15/2. Juventus will be without winger Douglas Costa for the clash after he was handed a ban for spitting during the Sassuolo clash, otherwise Allegri has a clean bill of health. In regards to the hosts, former Arsenal man Francis Coquelin has been ruled out with an Achilles injury. Ezequiel Garay is close to a return from a knee injury but will not be ready to face Juventus.